As a landlord, if you are letting out a particular property on a month-to-month lease, this template must be downloaded by you. Just customize print and use it as lease form agreement. 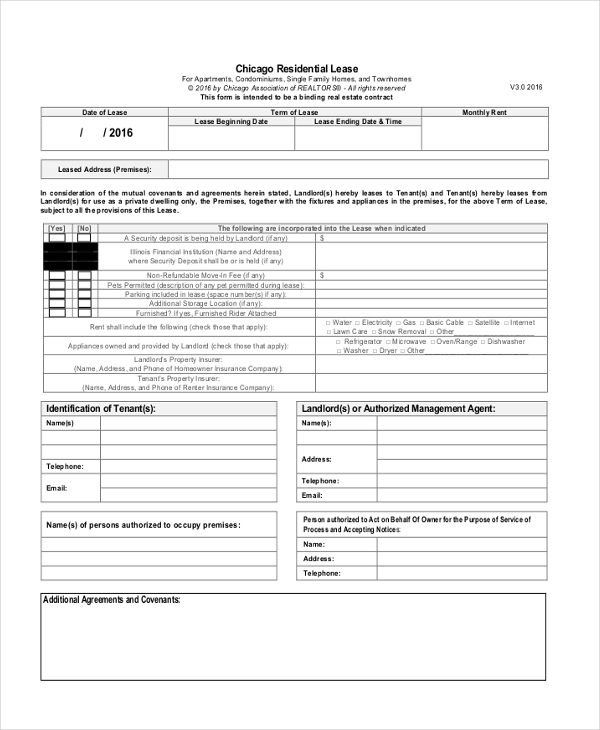 If you are letting out an apartment on a lease, then you may download this month-to-month lease apartment form template. Totally print ready, just customize the content and use it. 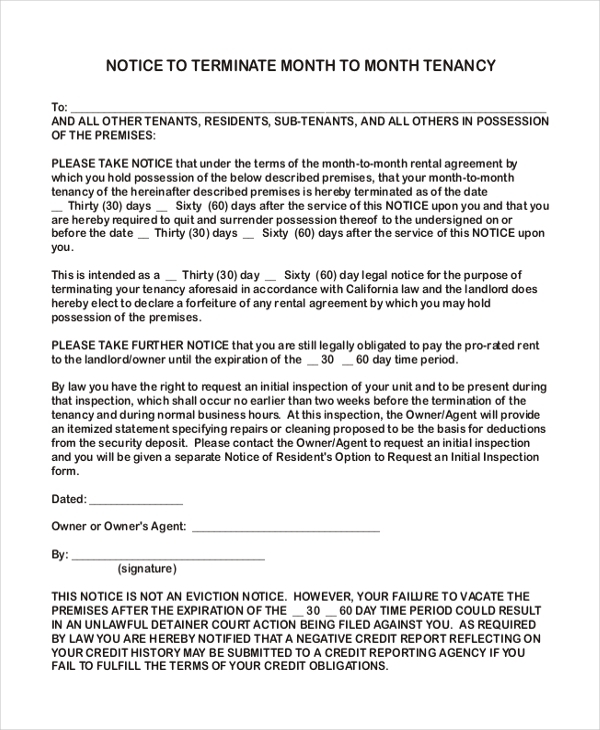 For issuing a notice to the tenants regarding termination of a lease agreement, this notice to terminate a month-to-month lease form template is totally apt. Download, customize, print and use. 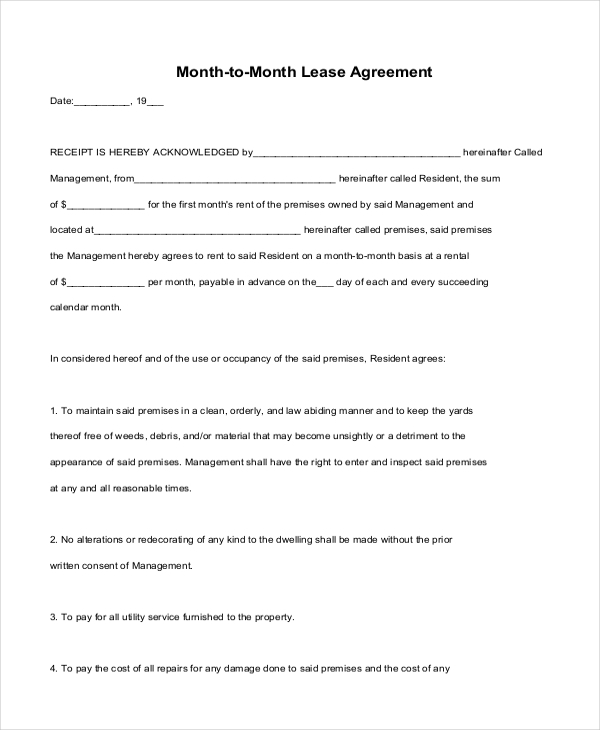 If you are an owner of a commercial property and want to let it out on a month-to-month lease, then you should definitely download this month-to-month commercial lease form template. Print and use. 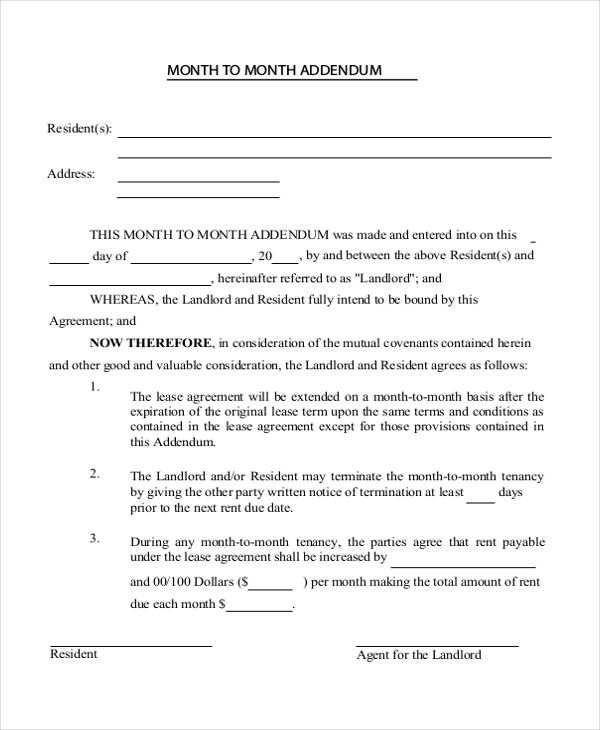 This month-to-month addendum lease form template can be very much beneficial for you as a landlord for letting out one of your property to a tenant. Just download, edit, print and use it as agreement. 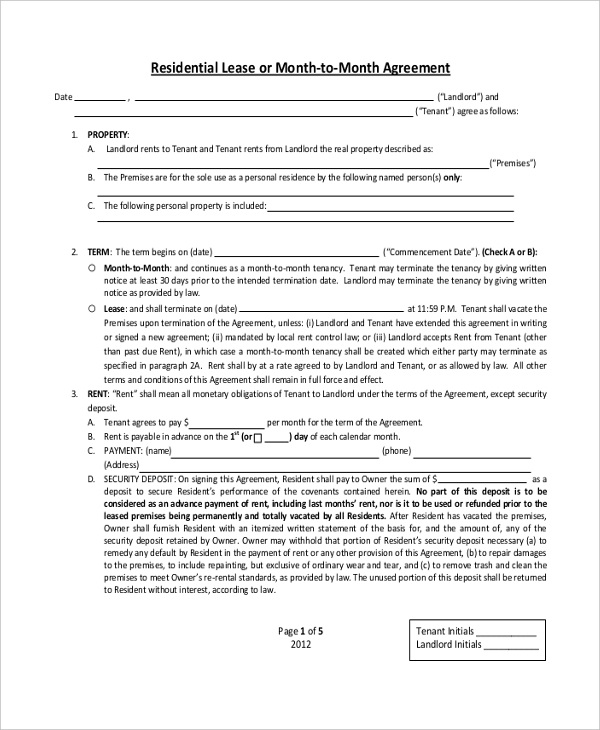 This is another great residential lease month-to-month agreement form template, which can be completely customized and then printed using a proper agreement between the landlord and the tenant. 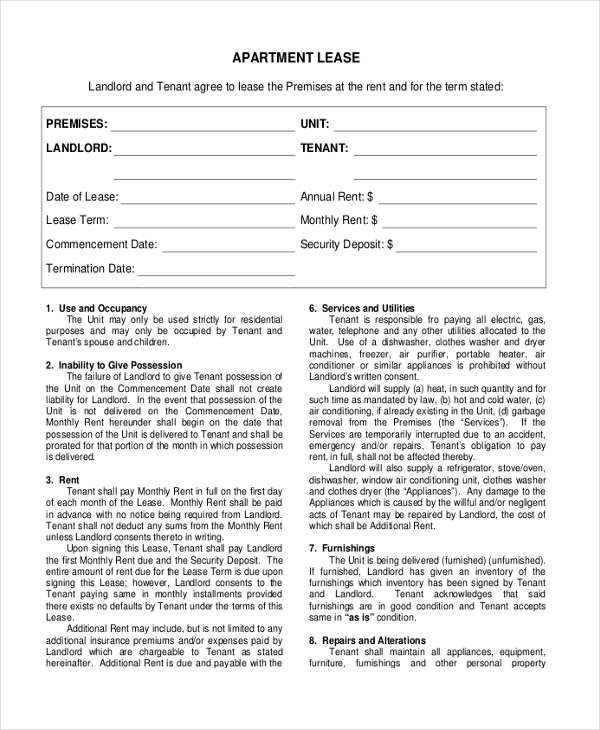 For landlords who are letting their properties on lease to tenants, this standard month-to-month lease agreement form template will be very useful for you. Just print it out and use. An agreement should always be created when as a landlord you are letting out one of your properties on lease to a tenant. 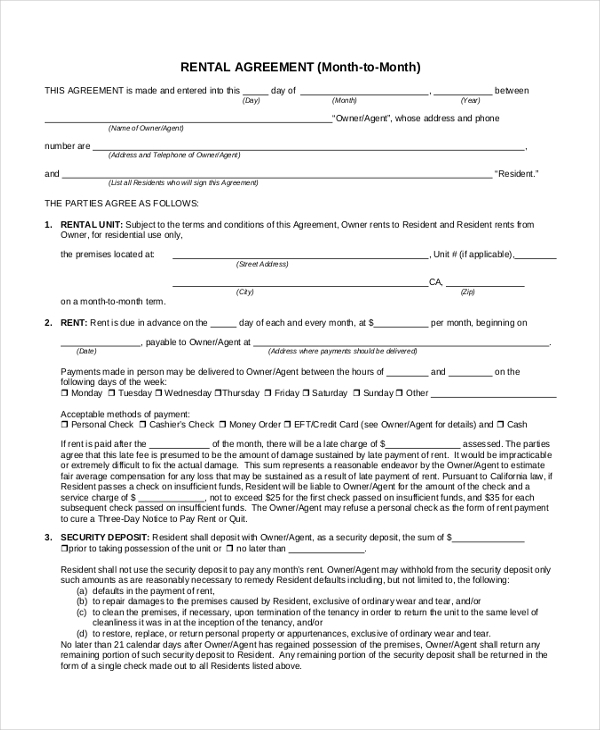 This is completely mandatory, the agreement consists of all the clauses mentioned by the landlord and after the tenant agrees, both of them sign the agreement copy and both parties keep one copy each of them. These Month to month lease sample agreement form templates are very much necessary for this reason, as it contains a proper format and many points mentioned already. Anybody can very easily use these templates by downloading, editing and later printing them. You may also see Rental Lease Forms. Any landlord of a property who is interested in giving away one of their properties on the lease can download these sample month to month lease form templates. Even any interested tenant can download these templates as well. These Month-to-Month Lease sample form templates are available in Word and PDF formats. Many varieties are available based on your requirement of the content and type. These templates are print ready and 100% customizable, you can add or replace the clauses or points mentioned and use them accordingly. The agreement form templates are neat and are designed in a very professional way. You can also see Commercial Lease Forms. Browse through our collection of various Sample Month-to-Month Lease templates just like Lease Renewal Forms. While creating an agreement between a landlord of a property and tenant who is taking that property on lease, these templates can come handy. Download them based on your type and requirement, and use them.